Welcome to iDrawCrap! Thank you for clicking on whatever you clicked on to get you here! My name is Todd Gass and I am a nobody who likes to pretend I can draw paint and sculpt things that someone else might find interesting. As is true with many people who claim to be artists, lack of motivation and procrastination are very real and very destructive entities. This blog is my attempt to fight back. I’m hoping that by doing this blog I can convince myself that there are people expecting something from me, and in turn, I can be more productive. A HUGE thanks goes out to my coworker and friend John D who planted this whole blog seed in my head. He makes my crap look even crappier. Check his stuff out: Mostly Arty Somewhat Farty or Comic Book blogs. This first post is going to contain some categorized samples of my earlier crap that I haven’t lost or destroyed yet. I am horrible with time and record keeping, so I’m not even going to try to guess how far back some of these go. A quick word of warning: there will be plenty of foul words going forward as well as adult content, so please hit that back button now if you are easily offended!!! 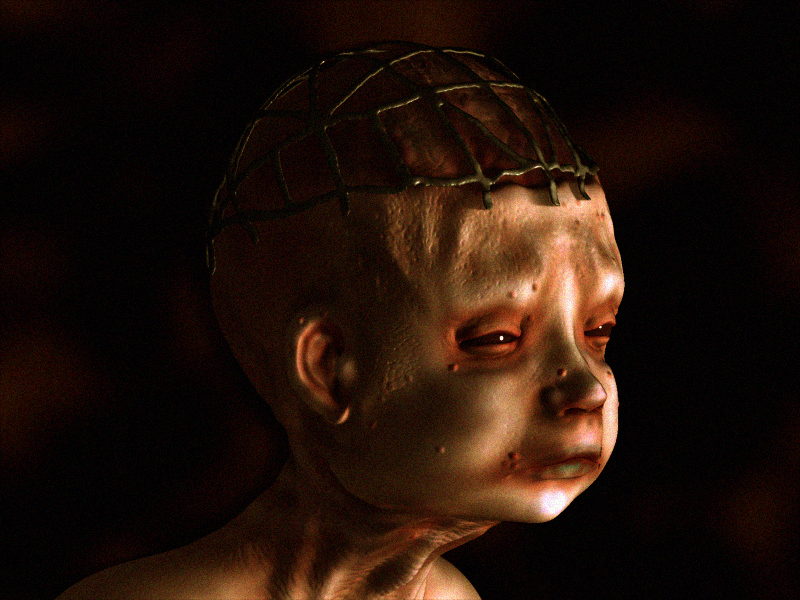 “Baby Mesh Head” – An early Zbrush piece I am sort of proud of.